Given the Armada's size, the rearview camera is almost a necessity. It isn't available on the SV trim, which means you'll have to step it up to the SL to drive this tank comfortably. 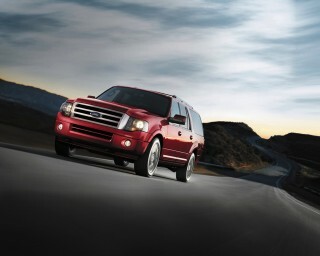 The 2014 Nissan Armada has grown old in a segment that has improved its technology, safety, features and fuel economy. 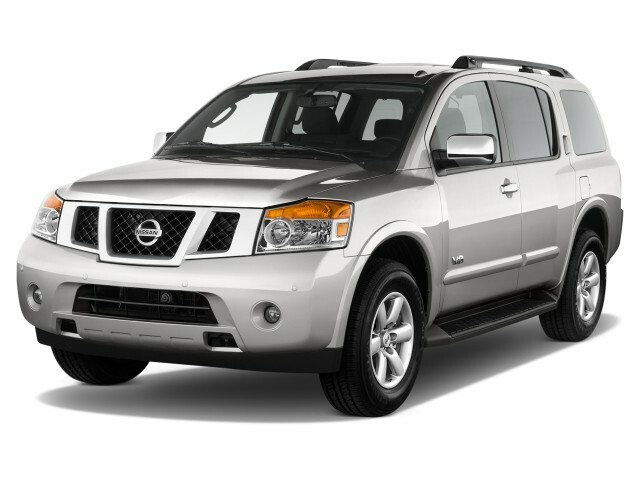 The Nissan Armada is a full-size SUV, one with masculine looks and an imposing stance wrapped around its roomy interior. But it's also a decade-old vehicle that hasn't kept the blistering pace of new utes like the latest Tahoe, Suburban and Yukon. The Armada's still good for towing and hauling, but it's expensive to fill up, and has lackluster fit and finish. The Armada carries with it a kind of aging machismo that distinguishes it from more plain-Jane alternatives like the Chevy Tahoe or Ford Expedition. There's just something to its angled grille, rear door handles mounted in the pillars, and the arc of its roofline over the rear passengers. It's still well-organized inside, despite the fact that some of the buttons and plastics make it feel a little cheap by comparison to many of its competitors. It's quite the climb to get into the Armada, but once you've mounted the seats, you'll find a cabin that is as spacious as the exterior is expansive.The first two rows are quite comfortable, with lots of headroom resulting from the bowed roofline. Ordering second-row captain's chairs cuts down the overall seating capacity by one, from eight to seven. The third-row seat doesn't have quite enough room for adults, and the tall floor makes it a scramble, getting in and out. It also makes loading cargo into the rear more difficult than it could be. There's not much cargo space behind the third-row seat, either, so you'll be leaving it folded down if you use the Armada regularly for family errands. The Armada shows its age with interior materials. Nissan has dressed up the interior a bit better in recent years, but there are still too many dull plastic trim pieces inside. In multiple test vehicles over the years our editors have noted a fair amount of wind noise, and engine noise in these vehicles is cranked up to an almost ever-present level. While the V-8 sounds good, it can get wear on you on long mountain passes, or when towing. Nissan's "Endurance" V-8 still takes up every nook and cranny in the engine bay, and though it sounds richly powerful and unabashedly an American-at-heart, its 317 horsepower is now down against the competition. The rumbly 5.6-liter eight kicks out strong acceleration off the line--Nissan claims 0-60 mph times of about seven seconds--thanks to a five-speed automatic that's a gear behind some other utes. The combination pairs up with either rear- or four-wheel drive. Passing ability is impressive, and the Armada 4WD tows up to 9,000 pounds. 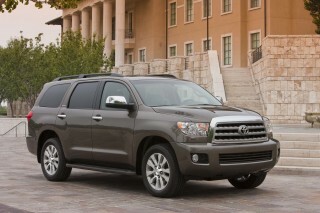 It has strong brakes, but the Armada's handling and its in-town maneuverability are not its strong points. Quick changes in direction will make you well aware of its mammoth size and heft. Ride quality in the Armada is firm but smooth, soaking up most bumps, but it isn't the most refined experience. Three different Armada trim levels are offered: SV, SL, and Platinum. Each can be had with rear-wheel drive or four-wheel drive. The Armada has a limited list of options, compared to the Tahoe and Expedition. At the top of the line, the Platinum gets heated front seats, a heated steering wheel, a moonroof, power rear liftgate, DVD entertainment, and a nav system with real-time traffic capability and hard-drive space for music storage. The fine lines on the original Armada have turned into full-blown wrinkles. It's masculine, oversized and overbearing. As the poster child for unsubtlety, there's little left to the imagination with the 2014 Nissan Armada–and we're ok with that. After all, there just aren't many giant SUVs with so much character left on the road today. You may not see quite as mean Armadas parading down the road as you might the Expedition or Tahoe, but it's been around for long enough to be recognizable to just about everyone on the highway. With its exaggerated, yet decidedly macho fender flares and wheel wells, this SUV hasn't sold especially well. Maybe it's the notchy roofline that swells over the passenger cabin, or maybe it's the funky door handles. Either way, there's no question that the Armada is more than just a little over the top--and looking a little aged, almost a decade after it was introduced. Inside the look isn't nearly as aggressive-looking—it's actually now one of the more softly-contoured designs in this competitive set—and while it's one of the more dated designs among full-size trucks it still feels well-laid out and straightforward. Smaller controls and more delicate buttons in general, though, project that it takes aim at suburban types more than the work-gloved crowd. The V-8 sounds great, but performance is just average, and handling is far from carlike. The Armada is based on Nissan's full-size Titan pickup truck, which means it come with same drivetrains and lusty exhaust notes. However, it's that drivetrain, along with the suspension and steering, that have fallen behind the competition. It's powered by a 5.6-liter V-8 that produces 317 horsepower and 385 pound-feet of torque. When the engine revs, you'd almost confuse it for a NASCAR V-8–it's that muscular sounding. The engine has been in the Armada for nine years now, and while its competitors have improved over their V-8s and even V-6s in that time, this mill has rested on its laurels. For example, the Ford EcoBoost V-6 produces 360 hp, and that comes from a 3.5-liter six-cylinder engine. With the five-speed automatic, the Armada launches smoothly and confidently from a standstill, and there's plenty of power for passing, too. 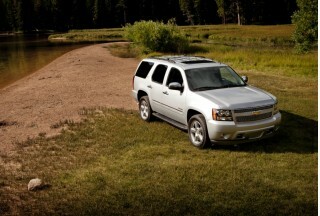 It moves from zero to 60 in just under seven seconds–good for its class–though some of the GM SUVs are quicker. With four-wheel drive and the towing package, the Armada can pull up to 9,000 pounds. A carlike steering wheel and shifter hint that the Armada driving experience is going to be more carlike, but it isn't. Brake feel is good, but steering, handling, and maneuverability are sore spots for this mammoth truck. Try to make any quick change in direction, and you're woefully aware of this vehicle's tremendous heft. The tall body and tall-sidewall tires don't help either, leading to a somewhat detached feel when making abrupt lane changes and the like. 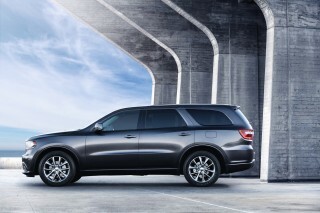 Ride quality in the Armada is firm but smooth, soaking up most small bumps, but it isn't the most refined experience. Wide open spaces inside the Armada get dressed in middling finishes. The Nissan Armada delivers a kind of outsized capability that very few other SUVs have mastered. 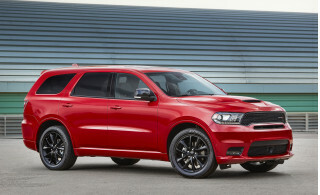 It's in the same class as the Ford Expedition or Chevrolet Tahoe, and it has the same dominating presence on the road, too. There are a few challenges that come with packing and fit and finish, though. Nissan has moved to dress up the Armada's interior in recent years, but overall, there are too many dull plastics in this interior, and trims still look on the cheap side. It's fairly loud on the go, too. In multiple test vehicles over the years our editors have noted a fair amount of wind noise, and engine noise in these vehicles is cranked up to an almost ever-present level. While the V-8 sounds good, it can get wear on you on long mountain passes, or when towing. Space isn't a luxury in the Armada, it's a luxury. 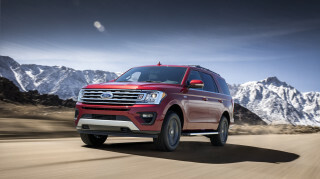 Once you clamber into the front seats--it's no crossover, so it does take some effort--you'll find wide, plush seats with a little bit more firmness and support than you'd find in the Ford or Chevy utes. The Armada's adjustable steering column and pedals make it easier for smaller drivers to find an agreeable driving position, and the very height of the chairs gives the commanding view of the road that's still prized by anyone even considering a vehicle this large. One row back, adults will still find a good amount of head and leg room. Nissan will switch the Armada's second-row bench seat for a pair of bucket seats if you want: that cuts down overall seating to seven passengers from eight, but gives those in the second row a more chauffeured feel. In back, the third-row bench is just passable for smaller adults, but it leaves almost no cargo space and headroom is tighter back there. There's no current crash-test data on the Nissan Armada, and none is expected. There isn't any current crash test date on the Armada, so we're going to give it our own 'moderate' rating. On the added-value side of the equation, the Armada gets standard rear parking sensors, while a rearview camera is available or standard. Advanced features such as blind-spot monitors and lane-keeping assistants are not available, but Bluetooth is now included on all models. While there's a pretty good view out when driving, thanks to the high vantage point and ample window space, the Armada's headrests and the vehicle's excessive height can get in the way of visibility when parking. The Armada just hasn't been ranked properly since the National Highway Traffic Safety Administration (NHTSA) shifted its ratings system in the 2011 model year. Before that change, the NHTSA had given the big Nissan SUV a mix of five- and four-star ratings, though it did not rank or test the Armada for side-impact protection. The Insurance Institute for Highway Safety (IIHS), meanwhile, has not tested the Armada. The Armada can't use crash-test scores as a selling point, and in safety technology, it's now running behind some of its full-size competition. Dual front, side, and curtain airbags, are standard, and the curtain bags protect all three rows of occupants. The Armada also has standard electronic stability control and anti-lock brakes, all mandatory features. The Armada gets some useful tech options like navigation, but it's not in the Ram/F-150/Sierra/Silverado race. 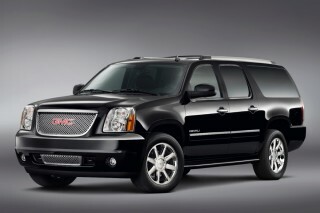 The Armada comes well-equipped in all models, with incremental increases in features as you climb in price. That said, there haven't been any recent or groundbreaking additions to high-tech features or infotainment in the past couple of years for this seven-seater. The Platinum edition, at the top of the range, gets a full bundle of luxury add-ons including a power tailgate; heated first- and second-row seating; a heated steering wheel; a sunroof; a navigation system with real-time traffic; and a DVD entertainment system for the rear two rows of passengers. While it's plushly outfitted in Platinum trim, the Armada doesn't have the voice-activated features of Ford's big Expedition or Explorer, or HD radio. The Armada comes in a choice of three models, and any of them can be optioned up from rear-wheel to four-wheel drive. The base version, the SV, offers power windows, locks and mirrors; dual-zone climate control; an AM/FM/CD player with USB port; power front seats; Bluetooth keyless entry; a flip/fold third-row seat; and rear parking sensors. The Armada SL picks up some more comprehensive feature content, including Bose audio; an auto-leveling rear suspension; a rearview camera; leather seating; and a power-folding third-row seat. Armada buyers can switch out the second-row bench seat for a pair of bucket seats. 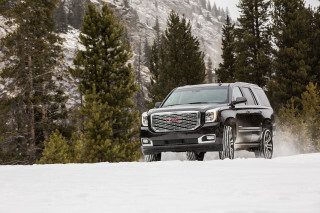 There's also a towing package to take advantage of its 9,100-pound towing capacity; the package adds a brake controller and seven-pin harness. The Armada has some of the lowest gas-mileage ratings among full-size SUVs. Unless you're looking at V-12-powered supercars, there are few vehicles on the road today whose fuel economy is as abysmal as a garden-variety full-size SUV. 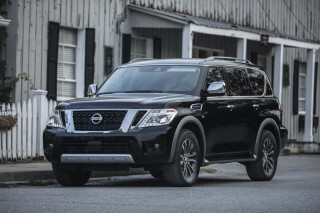 The 2014 Nissan Armada isn't an exception here. There's no option for diesel or hybrid power to mitigate the situation--the Armada comes only in one form, with a big V-8 and an automatic transmission. In its most recent calculations, the EPA gave the V-8 Armada a peak rating of 13 miles per gallon city, 19 miles per gallon highway. That's for the rear-drive version; putting heavier four-wheel-drive mechanicals on the body-on-frame chassis drops those figures to 12/18 mpg. While we'd like to dismiss these very non-green figures as an aberration, we've seen it with out own eyes (and fuel budget) in repeat drives; Nissan's full-size trucks (and this V-8) are far from fuel-efficient—even when compared to full-size V-8 trucks from GM, Ford, or Toyota.